Fishing Dry Flies for Trout on Rivers and Streams (Art Lee) – A friend gave me this book to encourage my education on fly fishing. While there is no substitute for actually fishing, Art Lee’s book has been an indispensable resource for me as I learn more about water, fish and improve my techniques. As a new fly fisherman, I learned much from this book, but have been told by experienced fishermen that everyone can get new ideas and learn something from this classic. Hatch Guide For Western Streams (Jim Schollmeyer) – Every fly fisher knows the best way to catch trout is to match the hatch. This book helps identify the nymph, fly or spinner and provides background information on insect habits and habitats and examples of fly patterns that mimic the real thing and the fly fishing techniques needed to fish them properly. I own dozens of field guides, but this one always goes with me to the stream. The Rites of Autumn (Dan O’Brien) – A falconers journey across the American West, a book about the why of falconry told by a person qualified to tell the story of falconry and the Peregrine Falcon recovery. This is not a “how to” falconry book for those that want to be seen with a bird of the fist. 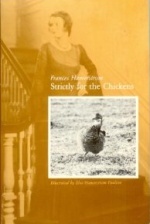 Stictly for the Chickens (Frances Hamerstom) – From Boston debutant to wildlife biologist in the wilds of Wisconsin in the 1930s, Fran Hamerstom tells the story of how she and her husband (students of Aldo Leopold) studied the vanishing Prairie Chicken. Fun and scientific, this is a must read for all budding naturalists and those that love game birds and prairies. An Eagle to the Sky (Frances Hamerstrom) – The simultaneous stories of the first woman to train and fly a Golden Eagle and the first successful artificial breeding of Golden Eagles by artificial insemination. The stories are told in her typically fun, but no nonsense short story style. Note About Fran Hamerstrom – I had the good fortune of meeting Fran on several occasions. The first time I met her was in 1983 at an eagle breeding facility. I was able to witness her reunion with the eagle “Chrys” after a separation of at least 10 years. They obviously recognized each other. The last time I saw her was at the 1992 National Falconry Meet in Lamar, Colorado. It was about 10°F and she was standing in the snow wearing sandals at age 82. My friends were amazed, but I knew that she still “skinny dipped” in the pond at her Wisconsin home as long as she could break the ice with an ax. She broke her hip on a trip to the Amazon jungle at age 87 and died in 1998 at the age of 90. They don’t make ’em like that any more. Everybody with young daughters should buy one of her books for them to read. 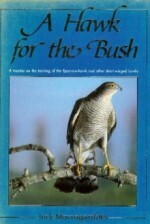 A Hawk for the Bush (Jack Mavrogodato) – A treatise on the training of the Sparrow Hawk and other short-winged hawks. The timeless classic on training and keeping short-winged hawks (Accipiters). This book has been out of print for years, but a new American edition was published in 2005. A must have “how to” book for aspiring austingers.